Anyone who has ever owned a car or any other type of vehicle understands that they require maintenance. Vehicles are machines, and they can wear down over time or sustain damage through routine use. This is an especially important task when it comes to large trucks. Not only are periodic inspections and maintenance required by law, they help to ensure the safety of everyone who shares the road. Statistically, truck crashes are among the most deadly traffic accidents for occupants in passenger cars. The National Highway Traffic Safety Administration (NHTSA) reported over 3,900 traffic fatalities involving large trucks in 2014, and notes that 73 percent of those killed were traveling in the smaller involved vehicle. Unfortunately, the state of Georgia was among the most deadly states in the nation that year, with only four other states experiencing more fatal truck crashes. While the causes of these accidents vary from driver distraction to weather factors to mechanical issues, one consistent problem with large trucks remains brake problems. The Federal Motor Carrier Safety Administration (FMCSA) named five different types of brake issues in the list of the top 20 roadside inspection violations in 2015. Commercial trucks are larger and heavier than most other vehicles on the road. Even in the best conditions, they require more stopping time and a longer stopping distance than smaller, lighter vehicles. These margins can often mean the difference between a near miss and a deadly crash. When a truck’s brakes are not functioning properly, they may need even more time and distance to stop to avoid a crash. Additionally, poor brake functions can lead to skids and rollovers. Both these situations can be very dangerous to other vehicles on the road, as the size and weight of a large truck can carve a significant path of damage and destruction. The dangers are heightened for everyone when a truck is involved in an accident, making the need for proper brake maintenance even more important. The vast majority of cited brake issues could have been caught and remedied with an owner or operator inspection and appropriate repair. Improper maintenance. Drivers and carriers are required to inspect and properly maintain their vehicles. However, this does not always happen. Even when inspections are done, often the repairs are not adequate, which can lead to crashes. Experts recommend that if one brake requires maintenance, similar repairs should be made to all brakes to maintain even braking power. To save time and money, many times this is not done. Uneven cargo loading. If cargo is loaded or secured improperly, it can shift during travel. With an uneven weight distribution to the vehicle, braking can be very difficult. Pressure is put on the brake system at different places, reducing the system’s ability to function adequately. Depowering the front brakes. 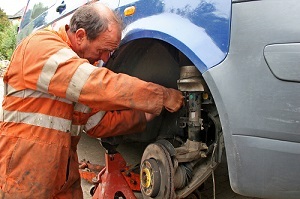 There have been instances in which an owner or operator will cut the power to the front brakes and have the vehicle rely only on the braking power from the back to stop the vehicle. While this may save wear and cost, it can be a dangerous practice when the truck is not able to generate the proper amount of power to safely stop. When owners or operators take shortcuts in inspection and maintenance when it comes to brakes, it is often others on the road who suffer the consequences. If you or someone you love has suffered injuries in a truck accident due to bad brakes, you may be eligible to make a claim. Contact the experienced truck injury lawyers at Rechtman & Spevak in our Atlanta office at 888-522-7798 to learn more about your rights and legal options in Georgia.